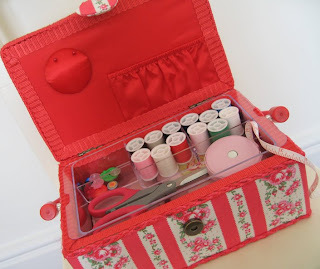 A while ago I saw a sewing kit that Annie had made for her own daughter's birthday. 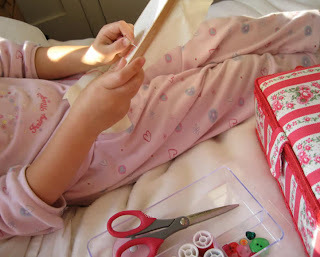 I loved her idea, and seeing it brought back memories of how much I had treasured my own sewing box that my grandmother gave to me one Christmas - the beautiful red satin lining, pins all of my own stored on a special wheel and some grown-up looking red-handled scissors...I have been slowly collecting and making items to put together something similar for my little Zebra's birthday. 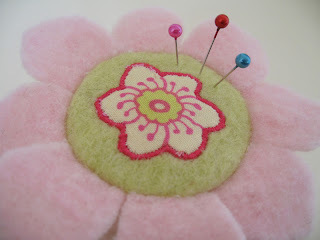 I modelled the pin-cushion on one that I'd seen on Anna Maria Horner's lovely blog, but I think that one was incredibly large, so my one is a miniature version, made in thick felts rather than cottons, and with an appliqued flower on the top. 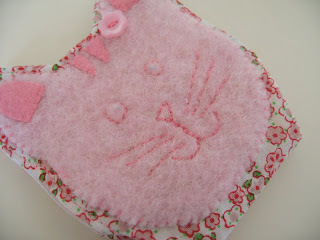 I loved making this needle case as I knew that, in the absence of a real one, the cat would be appreciated. I bought a needle-case in the shape of a cupcake at a fair last year from a lady whose sewing I admire hugely, and the way it opens is so ingenious (to me, anyway) that I decided to use that as my starting point and build in the feline shape around that design. And here is Zebra-girl's new sewing box - Cath Kidston loveliness. And how delighted I was to lift the lid and see that inside it is almost identical to my own childhood basket. 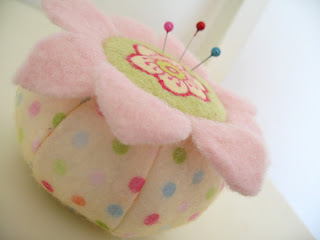 I filled it with buttons, threads, tape measure, heart-headed pins, pin tin, and of course pin cushion and needle-case. She looked so pleased with it when she opened it. 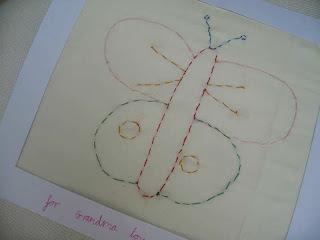 By 8am this morning she was stitching away in preparation for seeing her grandmother today who was having her own birthday. 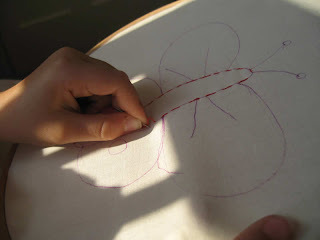 First she drew the outline of a butterfly with an erasable pen and then got to work stitching over her lines in carefully chosen thread colours. 'Grandma will love this!' she exclaimed with absolutely certainty as she stitched away - and she did. Below is the finished picture. Mr Teacakes has barely stopped working over the last couple of weeks and so his normal cake-making antics had to be scaled down as he didn't have time to start decorating the cake until 1am one evening (or perhaps that should be morning). 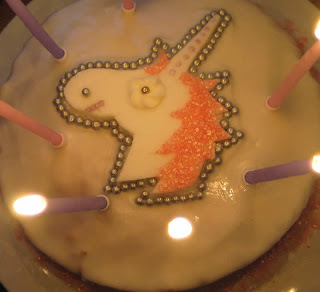 I had baked the actual sponge earlier in the day and came down the next morning to find that he had decorated it with this lovely unicorn. Ian seemed disappointed over the lack of time that he'd had to do anything more adventurous and we both ended up laughing when Zebra-girl looked both confused and delighted (because constant delight is the only mode of being when it is the day of your birthday and you're seven years old) as he presented it to her while we all sang happy birthday. Is it a bird? She asked. Erm, no. Poor lovely, tired Ian. I felt pained for him, even though I knew that he wouldn't really mind. I have been most tardy and awful on responding to commenty loveliness over the last couple of weeks (okay, actually, it's never been one of my strongest points, but things have now reached an all-time low), but I just wanted to say how much I really, really love receiving your comments and that I'm so sorry that I don't have the hours in the day to respond as much as I'd like to at the moment. The midday school pick-up means that I have less time now than when Dinosaur-boy was at nursery and what time I do have seems to have been taken up with sewing projects, leaving little time to report on them....oh, and that imaginary shop site I keep mentioning...it's nearly finished (yippee!). So because it may be Christmas before I reply individually, I will say now that the much coveted cotton reel holder can be bought from here and that I am wishing all of those who do buy one, many happy hours of colour arrangement. My own thread racks were actually bought locally and only hold 60 reels, rather than 90 (but were substantially less expensive, so perhaps it's worth doing a more extensive Internet search, although I have bought things from Cotton Patch in the past and think that their service is excellent), but in every other way they are identical. Last week I received an email from Pipany (I had been admiring the Grandad-style shirt that she had rustled up for her man) in which she mentioned how much she was enjoying using the walking foot that I'd told her about. I was so pleased as sometimes I feel reticent in recommending my newly acquired gadgety things as I assume that everyone must already have owned all these things for several years before I belatedly stumbled upon them. But I absolutely love sewing gadgetry, so the delight of knowing that evangelising about the walking foot caused Pipany to actually go and buy one and love it as much as I do...well, I suddenly find that I need no second bidding to share my delight in some other pieces of wonderfulness. So, firstly, this picture above...can you see how tiny the hole in the needle plate is? It makes it perfect for quilt piecing or just about anything else where you frequently experience the corner of your material being sucked down towards the bobbin when you take your first or last couple of stitches. The hole is only big enough to accommodate the needle, meaning your fabric stays above the plate. Its restrictions are that you can only use it for straight stitches and with a central needle position...but then both of those things are fine for lots of projects. I think it's called a Straight Stitch Needle Plate. You may have noticed that my machine was looking a bit linty in the first photo (it's quite amazing what only becomes apparent in a macro photograph), which is where this paintbrush comes in. The woman who ran the fantastic sewing course that I went on recently, told us that these brushes that are sold for £1 in the Early Learning Centre are the best thing to clean your machine with, especially around the bobbin case...as one who used to only clean her machine bi-annually I am now quite disgusted by my old self, as my de-linting brush swooshes out such enormous cottony tumbleweeds on an almost daily basis that I can only think that my previous machine had been forced to become self-cleaning under my neglectful ownership. I think it was Lina who prompted me to buy this 1/4 inch foot, and it is probably my most used machine add-on. When I'm making my own patterns they always have a 1/4 inch seam so that I can use this foot (I think you can get them with other allowances, but that's a treat for another day). You can see at the right that there is fixed metal guide - you simply keep your material butted up against it as you sew and this produces a perfect even seam without the need for marking out your seam allowances. The little red lines on it show you when to turn as you're approaching a corner. I think in theory the foot is meant for straight seams, but I also manage to go around gentle curves with it. Last week I mentioned a new fabric marking pen which I came across quite by chance, as I had picked it up as a replacement thinking that it would be like all my other marker pens. The type I've used in the past (air & water erasable) have had a fine felt-tip style nib, which is brilliant, but I've found that they dry up quickly if you're having a long marking session and need a short rest before being able to continue, so imagine my surprise in opening this one up and finding something resembling a Biro. 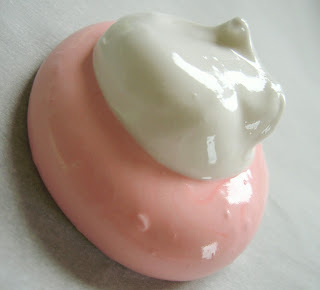 It is a dream to use, washes away easily and never seems to dry out and become awkward. It is made by Hemline and can be yours for £1.99. I have barely stopped using it this week and to steal a phrase from Katie Putrick, have found myself thinking that I haven't had this much fun since the pigs ate Uncle Billy. I feel sure that everyone must have one of these, but as I can barely sew without it, it seems worth mentioning (although I know Jo & Lisa both have them....and neither feel quite as excited by them as I do, proving that one woman's vintage Orla Kiely is another woman's crimplene underpants). For those seams where you need to mark out a tricksy measurement (or non-tricksy, but it's especially good for those times where constantly re-identifying where 23mm is would make your eyes hurt) all the way along a length of material this is invaluable. Simply set the red marker and then slide it along the edge of the material and make dots to join up later. Lastly, I've mentioned this cotton reel holder before, but it proved to be so fantastic that I have since had to buy a second one to go above it, as the first was beginning to overflow. Colour order has been restored and I am no longer being forced to hyperventilate over the lack of space in the row for pink threads. But, gosh, perhaps you have all been using these things for years? - I'm so sorry if this post brings to mind grandmothers sucking eggs (such a hideous image...in my mind the lady in question is wearing a polyester skirt and American Tan 10 denier tights, while toothlessly sucking on a freshly laid hen's egg complete with its shell)...does anyone have a more pleasing alternative to this expression - please do share, to save me from any more disturbing visualisations. As Zebra-girl occasionally asks to look at the pictures on my blog at the weekend I thought I'd leave showing some of her birthday presents until now, but as I've worked on little else all month - curtains, quilt, sewing box....photographed here is just the tip of a very large fabric iceberg - I'm quite desperate to start sharing some of them and actually getting back to writing on my blog occasionally! On a day out with Helen et al, we both bought some blank artists postcards in a discounted art supplies shop and she very cleverly came up with the idea of making them into little postal-themed packages to give as birthday presents...I knew Zebra-girl would love this idea and so created my own version for her. It includes a book of stamps, the aforementioned blank cards, some Cath Kidston postcards and a Cath Kidston Address book and a space for her pen. I loved stationary as a child and remember the pleasure of filling a fresh book with the names and addresses of everyone I knew - I am hoping that with all these items put together in one place it might give my little Zebra the freedom to write private letters whenever she wants and I know that her grandparents would love to be the recipients of her own unprompted missives. I am also imagining crisp autumnal walks to the postbox with her...so you can see my imagination has quite run away with me. Aside from the items that fill the stationary holder, when I looked at the gifts we've chosen for Zebra-girl this year (for I always review the present pile to make sure it is not found wanting a couple of days before the giving) I realised that with no initial conscious decision on our part, they are all mostly hand-made (for Ian has been busy creating his own presents for her too) or there to encourage the hand-made. After recently hearing about the scandal of the Chinese baby formula milk, on the tail of last year's revelations about the safety of toys made in China, I think our idea about what we want to surround our children with is changing. I've always favoured German-made wooden toys, largely from an aesthetic point of view, but also because they just felt 'right'...now I realise this instinct was a good one, but still our house is filled with a depressing amount of brightly-coloured plastic. As we discussed the lack of scruples of the factory bosses who'd been involved in bulking out the milk with melamine, Ian looked around the playroom and said his feeling was that he wanted to get rid of it all, but not only that, that he felt that everything was a little skewed at the moment, that we should be aiming for something simpler than what we were currently surrounding ourselves with. So in some ways these birthday presents reflect that (a fortunate coincidence). Looking through the children's toys we have found that so many of them are Chinese in origin that there are simply too many to abandon...I hope that we are not making a mistake in keeping them, I worry about what a childhood of constant contact with toxic chemicals will do to this generation of children (it is now near-impossible to find even school clothes not coated in Teflon to make them crease-resistant, storm and stain proof). When we've talked about these issues with our children in the past, Zebra-girl has taken to frantically checking the underneath of her toys and on finding ones that bear the Made in China stamp has been keen to give them away or we have found that her fondness for them has quickly evaporated...so we have tried to stop entering into discussion with her about it. Some days the long-term risks we all live with seem manageable and easy to put to the back of my mind, but on hearing about the poor babies in China, for this week at least, it suddenly all seems like a very real threat. And now after that rather down-beat outpouring I'm wondering whether the once-a-month posts weren't such a bad thing...I must go and listen to some Mr Ritter wonderfulness and then everything will seem loud and right again (I say Mr Ritter wonderfulness...but actually I prefer listening to Mr Teacakes version of this song...so I might go off and find him instead). Somehow two weeks have passed and not only have I failed to do any blog posts, but I have also found that I have barely even turned my computer on during this time too (my eyes are now round again - what an odd look that is). I realise this coincided with Dinosaur-boy starting school which may have caused some to worry that I had plummeted into a depression, sat pining at the school gates, or even eaten my own body-weight in chocolate buttons in an attempt to console myself (thank you lovelies for your emails checking that I was still alive). Pleasingly none of the above are true...what has actually happened is that despite the cunning appearance of more time, this has proved to be a strange mirage, and in reality I seem to have far less. But the hours I do have, have been filled almost solidly with stitching and I think it is fair to say that I have never had a time where I have sewn through quite so many yards of fabric, but more on those things in later posts. 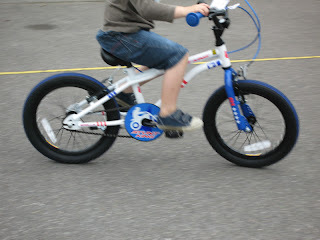 Bobbling round in my thoughts as I have stitched my way to the midday pick-up time at Dinosaur-boy's school is how my small ones might have been getting on. Both have had tearful moments at dropping off time, which is why we came up with a variation on a star chart. Mr Teacakes drew each a picture with areas of it numbered one to five and each tear-free day meant that a part of it could be coloured in and then given a stamp (we all love this stamper, which was a gift from a friend - I think she said she ordered it some time ago from here). A four storey house for Zebra-girl and a rocket and some aliens for Dinosaur-boy, once all the areas had been coloured there was a treat promised. While Dinosaur-boy, who is already in possession of a bean-filled frog, was eventually awarded some Cath Kidston playing cards featuring every kind of mode of transport imaginable, for Zebra-girl I made this velveteen frog. It hadn't occurred to me when I bought this fabric, but when it began to morph into something animal-shaped I suddenly realised that it felt to me as though it were the exact same shade as the rabbit in The Velveteen Rabbit... subsequently, no amount of looking through the numerous covers on Amazon is bringing up a rabbit resembling the one in my head, so perhaps it has changed in my memory over the years, but it pleased me to think of the book as I was making my frog version. The fabric is so very soft and strokeable, that it now seems much more obviously suited for children than the handbag that it was originally intended for. So anyway my brief two-week stitching news round-up is as follows: I have received some exciting stitchery books in the post (every single one of them creased even though they had all been posted separately and arrived several days apart...thank you Book Depository! ), dipped my feet into the waters of quilting and found that it may just be my new favourite thing (which I'll wibble on about more in another post, as when I was researching it I longed to find a simple tutorial that told me the basics of what to do with some tips thrown in, without being a part of a very involved pattern, so perhaps this might be something others would find useful?) and found a new fabric marker pen that is currently rocking my sewing corner with its sheer fabulousness. I think I have found The One this time. The others pale by comparison. Last weekend Mr Teacakes and I took the children out for lunch as an 'end of the summer holidays' treat. After our main course I had a peppermint tea while the others chose desserts. I had hoped that Ian would choose something I would like from the menu so that I might steal part of it, but he chose the rather dreary sounding Hazelnut Bombe...when I enquired as to why someone would choose such a thing when there was a Honeycomb Cheesecake on offer he said it was the meringue centre that was tempting him. I was speechless that he would feel the need to choose the most boring dessert on the menu just to get a small morsel of meringue. 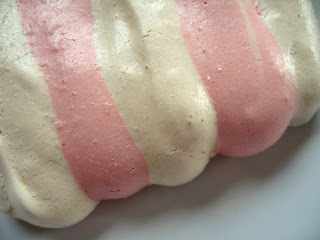 But I could make you meringue, I said, any sort of meringue you could wish for (you see what a little success with one batch of pink meringues can do to a girl, an ego gone wild)! That was all the incitement Mr Teacakes needed to come up with a challenge. 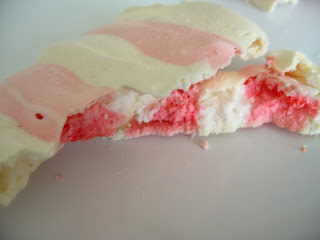 I would like a striped rainbow meringue please, he had said and later he added that he would like that meringue in the shape of a guitar (although he retracted that on the grounds of it being, in his opinion, impossible). 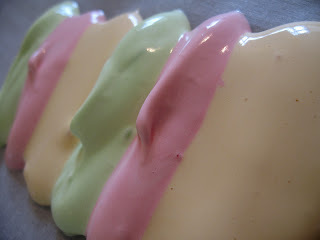 ...and we found that they were even more delightfully stripy when we broke into them. 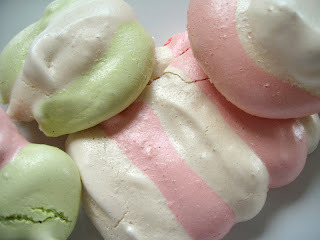 I love these pistachio green ones too. Other treats to end the summer holidays were trips to the swimming pool, a visit to some beautiful gardens, but best of all time in a deserted car park on Sunday afternoon. At the start of the summer I had made both children a chart in which they might collect stamps. For Zebra-girl stamps would be awarded for activities such as writing in a summer diary and for Dinosaur-boy playing alphabet games with me or learning to put his own coat on. Stamps were plentiful in every column, but for both of them the 'learning to ride my bike' (without stabilisers) column remained blank, in part due to a flat tyre that we hadn't gotten around to fixing. Which is why with only one day of the holidays left we felt compelled to spend an afternoon in a deserted car park. 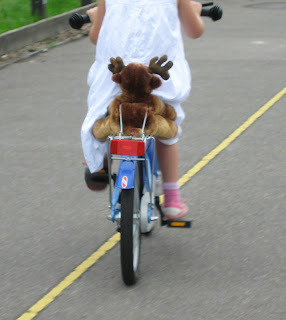 It wasn't long before Ian and I were able to stand in the middle and watch them both whizzing round us, Moose's antlers flapping gently in the wind as he rode pillion on Zebra-girl's bike. It is my happiest memory from the summer. And now it is September and suddenly I am a stay-at-home mummy with no babies at home. Dinosaur-boy went off to school today looking so small and so delighted by the wearing of a school uniform....and I am so aware that with that comes the end of an era for me...but for today at least, in the company of friends, warming cups of tea, shared morning cake and a seat in my favourite cafe that didn't feel quite as painful as I had expected it might. Sorry for this horribly long two-part post around the making of my sister's dress...for me it justifies two posts due to the magnitude of the project. While for others whipping up a dress may be something they mention in passing at the end of a post relating to other things, for me it is an occasion similar to the birth of a child that requires endless photographs of the newborn and the eating of chocolate eclairs to celebrate. Well, my sister arrived and tried on her dress...and it fitted, which was such a huge relief and I thought she looked wonderful in it. When I had phoned to let her know that it was ready she joked about whether she would be able to get her arms through the holes...which made me laugh and I felt comforted by the fact that she had asked me to make it for her, half-accepting that it may well be a disaster. It is a sign that she knows me well that she knew that aspect of dressmaking may prove troublesome to me (it requires small amounts of mathematics...I shall say no more) and how lovely it was to confess that the eventual arms on her dress were not the first pair to have graced the arm holes. But the arms did fit and with room to spare for at least another quarter of an arm in each...should that strange need arise. We were both pleased with the detail of this shiny button and the keyhole opening...but if I was ever to make something similar again I would use a lighter-weight interfacing for the dress facings as it took some work to reduce the bulk around the keyhole. And finally here it is about to be wrapped to give to my sister. A couple of days earlier when I had been about to show her the new Moo cards I'd received for my shop (it's taking so long it's beginning to feel like it might be a figment of my imagination...but apparently late September is looking hopeful), she had stopped me from showing them to her and said she wanted to see them as part of the opening of her dress...attaching your first Moo card to something is a little like opening your very best new stationary...it has that 'ahhh' factor of loveliness...even Mr Teacakes has been coveting them...so much so that he has now placed his own Moo order. ...filled with buttons, rather than spice, some of them are handmade ceramics.